Once again, I’ve reached back into my childhood for another favorite recipe from my mother, Ruth Meyer…wonder if she’s made any of these yet for this year??? This recipe is included in our “Between Friends” Cookbook on page 390. Mix Eagle brand milk, powdered sugar, coconut amd vanilla together. Drop by tablespoons (I use a small cookie scoop) onto waxed paper and chill for 2 hours or overnight. Melt chocolate chips and parafin in top of a double boiler. 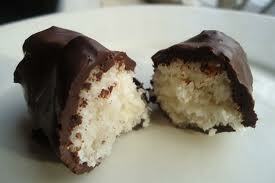 Drop coconut mounds into chocolate and place on waxed paper. Cool completely. Store in layers separated by wax paper in a cool place. Optional: Press one almond on top of each coconut mound before dipping into chocolate and presto, you have Almond Joy’s! *Note: This is one time when “double-dipping” is good! I dip the coconut balls in chocolate, let them cool completely and then dip again! Yum!